237-192. 3 Republicans voted for, 19 Democrats voted against. Now it’s on to the Senate in mid July. Stay tuned. First of all, let me state that they do raise some valid concerns, ones that I raised in my analysis as well – mostly centered on the potential for conflict across regulators and an over-reliance on regulators’ discretion. They also raise the same old tired groans about stifling innovation and making financial services more expensive for consumers. Completely baseless. Permanent Bailout Authority: The Dodd-Frank bill creates an “orderly liquidation” process by which regulators are empowered to seize financial institutions that they believe are in danger of failing and liquidate them. While the lack of a broadly accepted process for closing down large financial institutions helped lead to the massive bailouts of 2008 and 2009, this liquidation process is problematic. Federal regulators are granted broad powers to seize private firms they feel are in danger of default, and these powers are subject to insufficient judicial review. Such governmental discretion to seize private property is constitutionally troubling. This position is extremely disingenuous. Does Heritage also oppose the existing resolution authority the FDIC has over commercial banks? Would they rather these banks just fail outright with depositors either losing their deposits or having the taxpayers directly pay for them? Does Heritage support ending the existing Discount Window, through which troubled banks borrow directly from the Fed? My hunch is that the answer to all three questions is “no”. What does Heritage propose instead of a resolution authority? Nothing. Some Republicans have suggested simply creating a new chapter of the bankruptcy code, specifically for large financial firms. For the reasons I explained in my entry on Shadow Banking, this would not work. These firms are extremely dependent on short term (sometimes overnight) funding to run their operations. If they cannot roll over funding for a few days, they implode, at great cost to creditors. Bankruptcy courts can’t possibly move fast enough to liquidate these firms in an orderly manner. There was a reason for those all weekend long marathon sessions by the Fed and Treasury in 2008 to resolve failing institutions before the markets opened on Monday morning. However, there is a much broader issue here. The whole “just let them fail and allow the free market to work” worldview is a canard. Banks are not furniture stores, where a disorderly failure has a limited scope of collateral damage. There are significant, far-reaching negative externalities involved when a large bank fails. Many innocent non-financial businesses will be bankrupted. Individuals with no connection to the bank will be harmed economically. A more apropos comparison is with that of a nuclear power plant. Imagine such a powerplant has experienced a catastrophic failure and is about to have a meltdown. The Heritage argument is akin to “just let them fail, even if it means everyone living within two hundred miles dies and the land in that area all becomes uninhabitable for a few thousand years, so be it, the government must not intervene in private business affairs”. That is an absurd position, yet it is essentially the one they are taking here. A related argument is that the bill must somehow absolutely prevent another financial crisis to be worthwhile. Unfortunately, this argument is furthered by the bill’s sponsors, who have insinuated that it will do exactly that. It won’t. It is impossible to prevent financial crises. We can, however, take steps to make them less frequent and less severe and provide the regulators with the tools to better fight them when they occur. No reasonable person would argue against having fire safety regulations in building codes on the grounds that they cannot absolutely with 100% certainty prevent fires. Nor would they argue that having fire departments ensures that we will have fires, and so they should be disbanded. There are many improvements that could be made to the bill. They should absolutely be considered. There are also legitimate concerns about unintended consequences. They should be addressed. Fear-mongering and the spread of disinformation does nothing to further that end, and does a tremendous disservice to the public. Brown dug in his heels over the bank tax (which apparently he missed during the last round of negotiations), and with Byrd’s unfortunate death, the Democrats didn’t have the votes. Looks like the bank tax is out, and is being replaced by a redirection of funds from the TARP. FDIC deposit insurance is also being permanently raised to $250k. There are still a few senators in the “undecided” camp, so it appears the chances of passage by July 4 are slim. I’m not really sure why this is in here. I would have imagined this would apply to all federal agencies, but if not, it’s not something that should apply only to financial regulatory bodies. Require Lenders Ensure a Borrower’s Ability to Repay: Establishes a simple federal standard for all home loans: institutions must ensure that borrowers can repay the loans they are sold. Oh come on. We really need to elevate the level of public discourse a few nothches above kindergarten. Prohibit Unfair Lending Practices: Prohibits the financial incentives for subprime loans that encourage lenders to steer borrowers into more costly loans, including the bonuses known as “yield spread premiums” that lenders pay to brokers to inflate the cost of loans. Prohibits pre-payment penalties that trapped so many borrowers into unaffordable loans. Ok, but almost all of these problems could be avoided by simply shopping around. Penalties for Irresponsible Lending: Lenders and mortgage brokers who don’t comply with new standards will be held accountable by consumers for as high as three-year’s interest payments and damages plus attorney’s fees (if any). Protects borrowers against foreclosure for violations of these standards. Well, that certainly puts some teeth into the regulations. Expands Consumer Protections for High-Cost Mortgages: Expands the protections available under federal rules on high-cost loans — lowering the interest rate and the points and fee triggers that define high cost loans. The total “points and fees” payable by the consumer at or before loan closing will exceed the greater of 8% of the loan amount or $400. Meeting wither of these criteria triggers a raft of additional regulation, including additional disclosures as well as the prohibition of “balloon payments, negative amortization, advance payments, an increase in the interest rate after default, the rule of 78s in calculating prepayments, or a prepayment penalty except under certain conditions”. The new legislation simply lowers the threshold for triggering this. Additional Disclosures for Consumers on Mortgages: Lenders must disclose the maximum a consumer could pay on a variable rate mortgage, with a warning that payments will vary based on interest rate changes. This is good. Too many home buyers jumped into ARMs without really understanding the risks. Of course, it didn’t help to have the Chairman of the Federal Reserve encouraging it as a rational way to save on interest. Fine, so long as the counseling doesn’t always focus on helping prospective home buyers figure out ways to buy houses they canot affors. For some people, the advice simply has to be “keep renting for awhile, you’re not ready to buy a house, and you’ll be worse off if you do”. Fills Regulatory Gaps: Ends the “shadow” financial system by requiring hedge funds and private equity advisors to register with the SEC as investment advisers and provide information about their trades and portfolios necessary to assess systemic risk. This data will be shared with the systemic risk regulator and the SEC will report to Congress annually on how it uses this data to protect investors and market integrity. Registration of Hedge Funds is a good idea. It does not, however, “end the shadow financial system”. I’m not sure I buy the argument that “states have proven to be strong regulators in this area” and so we should raise the threshold for federal regulation. Might this cause some additional “regulator shopping” and encourage hedge funds with under $100 million in assets seek to relocate themselves in states with weak regulation? I don’t know, but it seems likely. This is all fine and well, but it does not address the fundamental conflict inherent in having the security issuers pay for credit ratings on the securities they issue. Liability: Investors can bring private rights of action against ratings agencies for a knowing or reckless failure to conduct a reasonable investigation of the facts or to obtain analysis from an independent source. NRSROs will now be subject to “expert liability” with the nullification of Rule 436(g) which provides an exemption for credit ratings provided by NRSROs from being considered a part of the registration statement. These two provisions have the potential to do a lot of good. The threat of being sued for providing bad ratings, and having your firm deregistered for consistently doing it is a fantastic incentive. It remains to be seen how the courts will rule in these suits, and how willing the SEC will be to deregister repeat offenders, however. This is a good provision. A big step in the right direction. We should eliminate all federally mandated use of credit rating agencies. This one seems too obvious to even be mentioned. I’m surprised these sorts of conflicts are allowed today. Easier said than done, unless you either eliminate buyer pays entirely or have the government simply assign ratings agencies to securities issuers. Can someone tell me what pressing social value there is in allowing banks to invest in hedge funds? The investors should not have the power to require some “skin in the game” by the investment advisor. The entire idea is absurd. I have long been in favor of an updated Glass-Steagall. In fact, I would go so far as to prevent both commercial banks and investment banks, under an updated Glass-Steagall, from having anything to do with hedge funds. By this, I mean ban hedge funds from taking loans from commercial banks or raising funds in the public capital markets. Ban them from engaging in repo transactions as well. If they want to gamble, let them, but restrict them to gambling solely with their owners’ equity. Stronger lending limits: Adds credit exposure from derivative transactions to banks’ lending limits. .
Ok, but how is this exposure to be calculated? Improves supervision of holding company subsidiaries: Requires the Federal Reserve to examine non-bank subsidiaries that are engaged in activities that the subsidiary bank can do (e.g. mortgage lending) on the same schedule and in the same manner as bank exams, gives the primary federal bank regulator backup authority if that does not occur. I need to research this one further. I don’t like the idea of commercial firms owning banks, and I especially don’t like the idea of holding company structures that obfuscate the relationship, which is what this sounds like. Interest on business checking:Repeals the prohibition on banks paying interest on demand deposits. Wait, what? I thought Regulation Q was done away with 20 years ago. Another obvious one that leaves anyone with a pulse boggled at how this could have been allowed previously. Streamlines regulation of surplus lines insurance and reinsurance through state-based reforms. A step in the right direction. It was always unsettling how a company with the size and reach of AIG could have been regulated by a sleepy old state insurance office, outside the oversight of the federal government. Protects Small Businesses from Unreasonable Fees: Requires Federal Reserve to issue rules to ensure that fees charged to merchants by credit card companies for credit or debit card transactions are reasonable and proportional to the cost of processing those transactions. Neutral on this one. I’m not sure the Federal Reserve is best equipped to deal with this. It seems to me it’s more a question of the use of monopoly power, in which case the FTC should have jurisdiction from an antitrust perspective. A step in the right direction, albeit a small one. As someone who has personally suffered harm from incorrect information on my credit report, and having had to exhaust an inordinate amount of time and effort to get it rectified, I’d prefer to see a provision allowing consumers to sue credit reporting agencies for failing to remove erroneous information in a timely manner. Public Disclosure: Requires public disclosure to the SEC payments made to the U.S. government relating to the commercial development of oil, natural gas, and minerals on federal land. SEC Filing Disclosure: The SEC must require those engaged in the commercial development of oil, natural gas, or minerals to include information about payments they or their subsidiaries, partners or affiliates have made to a foreign government for such development in their annual reports and post this information online. Manufacturers Disclosure: Requires those who file with the SEC and use minerals originating in the Democratic Republic of Congo in manufacturing disclose measures taken to exercise due diligence on the source and chain of custody of the materials and the products manufactured. I’m not an oil/gas/minerals person, but more disclosure is generally a good thing. This makes sense, given how long its been since the $100k limit was established. One could argue that premiums charged banks by the FDIC should be raised substantially, perhaps even by a factor of 2.5%, in exchange for the increased insuranc eprovided. If banks pass the costs on to the consumer through higher fees or lower interest rates, that’s a good thing. Insuring deposits is a valuable service, it exposes the government to some risk, and depositors rather than taxpayers ought to be paying for that. Restricts US Funds for Foreign Governments: Requires the Administration to evaluate proposed loans by institutions such as the IMF or World Bank to a middle-income country if that country’s public debt exceeds its annual Gross Domestic Product, and oppose loans unlikely to be repaid. Interesting. I’m not sure how the US, as a member of the IMF and World Bank, can unilaterally make this sort of decision without running afoul of the agreements we made when joining these organizations. It’s pretty obvious this provision was added as a response to the recent sovereign debt problems in parts of the EU. 1. The overall approach of the legislation is to establish new regulatory agencies, shuffle around existing agencies, and then assign broad, but vague responsibilities to the agencies in the new structure. There is also quite a bit of establishing committees to conduct studies and make recommendations that may or may not be addressed in the future. The legislation itself continuously shies away from actually implementing changes. 2. At least from what I have seen, the legislation does nothing to address the shadow banking system. During the crisis, the FDIC had to step in and provide deposit insurance to money market funds. That was a monumental decision with far-reaching implications. Where is the regulation of money market funds in this legislation? Where is the regulation of repos? Where is the regulation of the commercial paper market? Where is the regulation of hedge funds, beyond requiring the largest ones to register with the SEC? In other words, where is there at least an attempt to bring the shadow banking system out of the shadows, and prevent another run on it from occuring? For the above two reasons, if I had to grade the financial reform legislation, I’d give it a C-. In this post I’ll address Section 1, entitled, “Consumer Protections with Authority and Independence”. Creates a new independent watchdog, housed at the Federal Reserve, with the authority to ensure American consumers get the clear, accurate information they need to shop for mortgages, credit cards, and other financial products, and protect them from hidden fees, abusive terms, and deceptive practices. I’m still not convinced that the Federal Reserve is the right place for this sort of agency. Examination and Enforcement: Authority to examine and enforce regulations for banks and credit unions with assets of over $10 billion and all mortgage-related businesses (lenders, servicers, mortgage brokers, and foreclosure scam operators), payday lenders, and student lenders as well as other non-bank financial companies that are large, such as debt collectors and consumer reporting agencies. Banks with assets of $10 billion or less will be examined for consumer complaints by the appropriate bank regulator. 1. As expected, note the absence of auto dealers from this list. It was widely reported in the media that auto dealers lobbied hard to get an exemption and that appears to be correct. But why? Cars are the second largest financed purchase (after a house) most consumers will ever make. It makes no sense to exempt them from consumer protections. 2. What is the rationale for the $10 billion cutoff? If anything, it is the smaller, fly by night, operations that have tended to be the worst offenders in the past, why ignore them? This agency should have jurisdiction, within the confines of consumer protection, over all financial firms. The objective here seems to be at odds with the $10 billion cutoff inserted in the previous provision. If you’re going to centralize, then centralize. If it weren’t for the failure of the regulators to act on these sorts of abuses in the past, despite it being within their jurisdiction to do so, that would be funny. Nothing wrong with those two proposals, though I doubt anything meaningfull will result. This is all happy, feel-good type stuff. The best way to avoid turf wars between regulators is to consolidate regulatory agencies into a smaller number of them. While it may be tempting to try and address the problem by simply drawing hard lines between jurisdictions, financial innovation is very real and will blur the lines and create new products that slip through the gaps almost immediately. Overall, consumer protection is a good thing, and there are positive aspects to the legislation in this regard, but this is hardly central to the objective of minimizing the probability of a repeat crisis. In this post I’ll address Section 6, entitled, “Protects Investors”. Provides tough new rules for transparency and accountability for credit rating agencies to protect investors and businesses. Fiduciary Duty: Gives SEC the authority to impose a fiduciary duty on brokers who give investment advice – the advice must be in the best interest of their customers. I thought I read that applying the “fiduciary duty” standards of Financial Advisers to Brokers was removed in the latest round. Perhaps that was misreporting in the media – it appears Congress is simply punting on this issue by giving the authority to do this to the SEC and letting them decide. Encouraging Whistleblowers: Creates a program within the SEC to encourage people to report securities violations, creating rewards of up to 30% of funds recovered for information provided. Well intentioned, but it’s not hard to see how this one could have negative unintended consequences. SEC Management Reform: Mandates a comprehensive outside consultant study of the SEC, an annual assessment of the SEC’s internal supervisory controls and GAO review of SEC management. A good proposal. We should do this with every government agency. Odd. This is the core mission of the SEC. Establishing a committee within the SEC to advocate for its core mission seems to me to indicate management dysfunction within the organization. That one is a no-brainer. The SEC is in dire need of additional funding, however, there ought to also be some performance targets associated with receiving it. Skin in the Game: Requires companies that sell products like mortgage-backed securities to retain at least 5% of the credit risk, unless the underlying loans meet standards that reduce riskiness. That way if the investment doesn’t pan out, the company that packaged and sold the investment would lose out right along with the people they sold it to. This one sounds good in theory, but in reality, a major reason why banks found themselves in trouble was that they retained too much exposure to the securitized products, both directly on balance sheet and indirectly through SIVs and such, as opposed to too little exposure. If anything, it was the mortgage brokers, rather than the banks, who should have been made to have more skin in the game to properly align incentives. A good provision. It remains to be seen whether this will take the form of aggregate statistics – LTVs, FICO scores, DTIs, etc. at the portfolio level, or whether it will require loan level detail. All good ideas in theory. In practice, I can’t help but wonder how this would have altered behavior with regard to the Auction Rate Securities debacle. Again, devil is in the details. Overall, I’m neutral on this section – some decent ideas, some potentially bad ideas (risk retention of securitization for banks), but mostly the same approach as the rest of the bill – establish committees to make recommendations along with vague expansions of authority. In this post I’ll address Section 5, entitled, “Executive Compensation and Corporate Governance”. Provides shareholders with a say on pay and corporate affairs with a non-binding vote on executive compensation and golden parachutes. Nominating Directors: Gives the SEC authority to grant shareholders proxy access to nominate directors. Also required directors to win by a majority vote in uncontested elections. These can help shift management’s focus from short-term profits to long-term growth and stability. No Compensation for Lies: Requires that public companies set policies to take back executive compensation if it was based on inaccurate financial statements that don’t comply with accounting standards. I’ll make this one short and sweet. Independent compensation committees on Boards of Directors are a good thing. Giving shareholders a say on pay CAN be a good thing if it’s tightly controlled and used in only the most egregious cases. Proxy access for nominating Directors CAN be a good thing if it’s used by investors to get control of underperforming management, as opposed to being used by special interest groups with political agendas unrelated to the performance of the company. Clawbacks of performance pay in the event of manipulated accounting results are also generally a good thing. However, none of this has anything to do with the financial crisis. What’s noticeably absent is any proposal to align compensation on Wall Street with incentives for long term performance (as opposed to bet the farm and then retire with this year’s bonus before the whole thing implodes). In this post I’ll address Section umm, I’m not sure what number to give it since it was excluded from the summary paragraph, entitled, “REFORMING THE FEDERAL RESERVE”. Federal Reserve Emergency Lending: Limits the Federal Reserve’s 13(3) emergency lending authority by prohibiting emergency lending to an individual entity. Secretary of the Treasury must approve any lending program, programs must be broad based, and loans cannot be made to insolvent firms. Collateral must be sufficient to protect taxpayers from losses. This is an almost verbatim repeat from a previous section. Audit of the Federal Reserve: GAO will conduct a one-time audit of all Federal Reserve 13(3) emergency lending that took place during the financial crisis. Details on all lending will be published on the Federal Reserve website by December 1, 2010. In the future GAO will have authority to audit 13(3) and discount window lending, and open market transactions. This provision resulted as a compromise from months of wrangling between those who wanted the Fed to be subject to ongoing audits and those who wanted Congress to leave the Fed alone. I’m fairly neutral on this one, though I do NOT want Congress meddling in open market operations, via audits or otherwise. The Fed overstepped its bounds during the crisis, and should expect greater oversight now as a result of that, but monetary policy proper is an area where central bank independence is absolutely paramount. Transparency – Disclosure: Requires the Federal Reserve to disclose counterparties and information about amounts, terms and conditions of 13(3) and discount window lending, and open market transactions on an on-going basis, with specified time delays. I’m torn on this one. There is something to be said for maintaining the confidentiality of transactions with troubled institutions to avoid spreading panic. On the other hand, there has to be some limit to that, from the standpoints of scope and timing. Everything can’t be secret forever. Establishing a Vice Chairman, appointed by the President, gives us what exactly over just having a Chairman, likewise appointed? It definitely makes sense to look at the organizational structure of the Fed and identify areas for potential improvement. This is one of the cases where commissioning a study to analyze the issue and make recommendations makes more sense than just making an arbitrary change right now, like establishing a Vice Chairman. Election of Federal Reserve Bank Presidents: Presidents of the Federal Reserve Banks will be elected by class B directors – elected by district member banks to represent the public – and class C directors – appointed by the Board of Governors to represent the public. Class A directors – elected by member banks to represent member banks – will no longer vote for presidents of the Federal Reserve Banks. The office of FRB President, the procedures for electing them, and the candidates for the job are all pretty arcane. I don’t see how the “public” is going to be “better represented”, whatever that might mean, by this change. This too is an almost verbatim repeat from a previous section. Overall, there’s not much substance here. It seems to be more of a response to the “do something about the Fed” contingent, most of whom know little to nothing about the Fed beyond what they may have read on a conspiracy theory web site. In this post I’ll address Section 4, entitled, “Transparency & Accountability for Exotic Instruments” AKA Derivatives Reform. Eliminates loopholes that allow risky and abusive practices to go on unnoticed and unregulated – including loopholes for over-the-counter derivatives, asset-backed securities, hedge funds, mortgage brokers and payday lenders. Odd that the last three – hedge funds, mortgage brokers, and payday lenders were lumped in with derivatives. The devil will again, be in the details. I’ll just note that it was the Commodities Futures Modernization Act that explicitly exempted certain financial derivatives, including Credit Default Swaps, from regulation. This wasn’t a case of an alternative unregulated market organically growing alongside a regulated one, it was the result of a conscious decision by the regulators to explicitly not regulate these instruments. Central Clearing and Exchange Trading: Requires central clearing and exchange trading for derivatives that can be cleared and provides a role for both regulators and clearing houses to determine which contracts should be cleared. Requires the SEC and the CFTC to pre-approve contracts before clearing houses can clear them. First, let me state that requiring derivatives to be traded through a clearinghouse is absolutely a positive development. However, throughout the debate, there has been considerable confusion between the roles of clearinghouses versus exchanges, with many, inside and outside of government incorrectly using the terms interchangeably. A clearinghouse is a third party, sometimes owned by its members, that acts as a hub between parties in all transactions (as opposed to bilateral trading directly between market participants). This shifts counterparty risk directly to the clearinghouse, which attempts to resolve it through collateral requirements, regular marking of positions to market, and having all members be jointly responsible for any failures. An exchange is simply a mechanism for centralizing trades and making price and volume information publicly available. In practice, many existing exchanges have their own captive clearinghouse, but this need not be the case, and they are certainly synonymous. Ultimately, moving trading to a clearinghouse prevents the emergence of another AIG which makes a lot of one way bets that it can never hope to payout on in the event it loses, exposing the entire system to collapse (and subtly causing the underpricing of risk by firms who mistakenly believed themselves to be covered in the event of default). No issue with this as described. Regulates Foreign Exchange Transactions: Foreign exchange swaps will be regulated like all other Wall Street contracts. At $60 trillion, this is the second largest component of the swaps market and must be regulated. Odd that they decided to call this out, given that they did not previously identify the swaps being discussed as Credit Default Swaps. And while they’re at it, why not mention interest rate swaps? 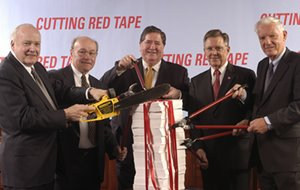 Increases Enforcement Authority to Punish Bad Behavior: Regulators will be given broad enforcement authority to punish bad actors that knowingly help clients defraud third parties or the public such as when Wall Street helped Greece use swaps to hide the true state of the country’s finances and doubles penalties for evading the clearing requirement. Oh come one. Fraud is already illegal. And how do you “double penalties” for new legislation where the baseline penalties haven’t even yet been determined? Having codes of conduct is fine, but I’m sure most firms already have them. The second part seems to weaken the responsibility of dealers to the enumerated types of clients. We’ll have to wait for more details on that one. Overall, requiring existing OTC dervivatives to be traded through clearinghouses is sound policy. The ultimate effect will be determined by the extent of the loopholes written into the law – the size of the remaining OTC market post-implementation.